Since the MODXpo in Munich last year, I’ve been discussing ways to improve the project leadership with many people from the community, starting with Gauke Pieter Sietzema. Over the past six months these discussions intensified and more community members were asked to join and help in formalizing this effort. Inspired by other successful governance models for Open Source projects, particularly Docker, it is the right time to take MODX to the next level. 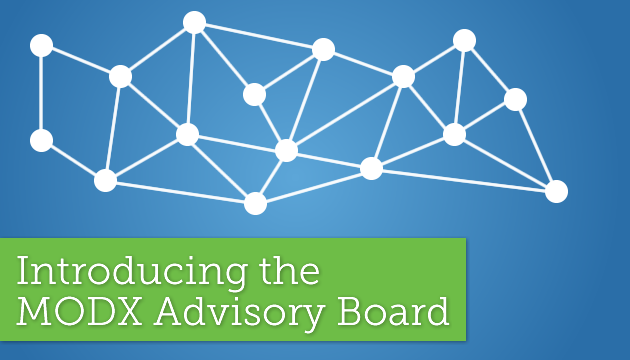 Today we’re excited to announce the MODX Advisory Board (the “MAB”). The MODX Advisory Board is a group of community members, made up of contributors, digital agencies, vendors and site builders. The MAB’s purpose is to advise on long-term strategic management of the Open Source project. This includes defining policy recommendations, proposing contributor processes, suggesting areas for ongoing maintenance, and more. For example, the MAB will help prioritize key areas of focus for and create a public roadmap for future releases. Gauke Pieter Sietzema was elected Chair of the board, and Christian Seel as the Vice-Chair. Both of these individuals are long-time MODXers who have been intimately involved with MODX for years, and have been key stakeholders in multiple MODXpos. GP, Christian and the other 9 founding members, joined by 4 MODX staff, will serve a preliminary six-month term through March, 2017 (15 total). The initial MAB work will focus on setting up the board and beginning work on the Public Roadmap. After this time, nominations will be opened for standard yearly terms. MAB membership requirements outlined in the charter (see links below) ensure the board members bring a variety of experiences and areas of expertise to reflect the broader nature of the MODX Community. The process and outcomes of all MAB matters, and the acceptance of any resulting recommendations, is intended to be conducted in the open with full transparency. Matters that may involve personal issues may be kept private. The formal way for the MAB to advise the project is through Recommendations. These documents are drafted by an editor, reviewed by the entire board and finally voted on. If a majority of the board is in favor of the recommendation, it is accepted and becomes official. All accepted recommendations are posted to the MAB section of the site. Only board members can propose a recommendation, but people in the wider community are invited to discuss their ideas with individual board members, who can sponsor the idea and bring it to the board. The MODX GitHub Repository is still the place to report bugs and request features. MAB recommendations are broader and more strategic in scope, and don’t specify specific technical implementations. For example, a recommendation that says MODX should adopt PSR standards could lead to feature/pull requests that go into the technical details of how to accomplish a goal. Today marks the first official day of the MODX Advisory Board. It’s new for all of us, and we’re still figuring out how everything will work practically. While the MAB already enjoys well-rounded representation across the board, we need an additional member from a midsize-to-large digital agency which primarily serves large brands that fall under the “Enterprise” moniker. We want to ensure their needs are fully represented going forward—as more and more Enterprise users enjoy all the things other savvy MODXers around the world have grown to love over the last decade or so of MODX. We hope you’ll join us on this path, and here are a few links to help get you start. Please feel free to reach out to MAB members, if you have an idea or wish to participate. I want to take the time to thank everyone who’s participated in forming the MAB. It’s an honor to have the privilege of having your experience, candor and enthusiasm, and to be a part of the next chapter of MODX.